roger: I can't figure out if it just won't AUTO-restore drivers or what. I think you can manually utilize the drivers it saves, otherwise I'm not sure of the point of the program. Anyway, a message to the devs wasn't answered so I'm not sure how to write this up. According to the website, the lite version will NOT restore drivers. In Lite version, the program is irrelevant. In full version, it's not better, because it detects on my machine drivers never installed !! Moreover, downloads are available on sites that are not those of the manufacturers, generating risk of incompatibility. Anyway, many motherboard manufacturer offering drivers "homemade". DriverBackup! proposed by Chris L. Franklin, now in version 2.1.07, is more comprehensive and more effective in identifying its drivers. According to juvera's link, it's now at 4.05, on the app's website it says 4.0. Not trying to revive this dormant entry, but... everyone complaining about a lacking restore option, please, do READ Andrew Lee comment! The lite version does the back-up. But you can NOT install the drivers without the full program. I'm over to "driver backup"
I also checked Driver Backup! but I can't see any Restore functionality. Am I blind? Tried Non-.Net version on windows vista. The problem with the Driver Backup! program on SourceForge is the .NET requirement, this kind of kills it's portability to me. Nice Tool. Saves a lot of time. Dont bother with Driver Magician Lite as it only does half a job and you have to pay for the other half!! Why would any one pay for something like this, when theres a GPL version available ? Simply amazing... I never even thought of a program that would consolidate your drivers all into one place. Great idea! Takes a bit to copy all of the drivers, but that's ok. Since the INF + driver files are copied to the backup folder (with the files for each device in its own named subfolder), you can simply specify a particular folder when Windows asks you for the driver disk. Granted this is not as convenient as whatever "Restore" feature the paid version provides, but it's still quite useful IMHO. 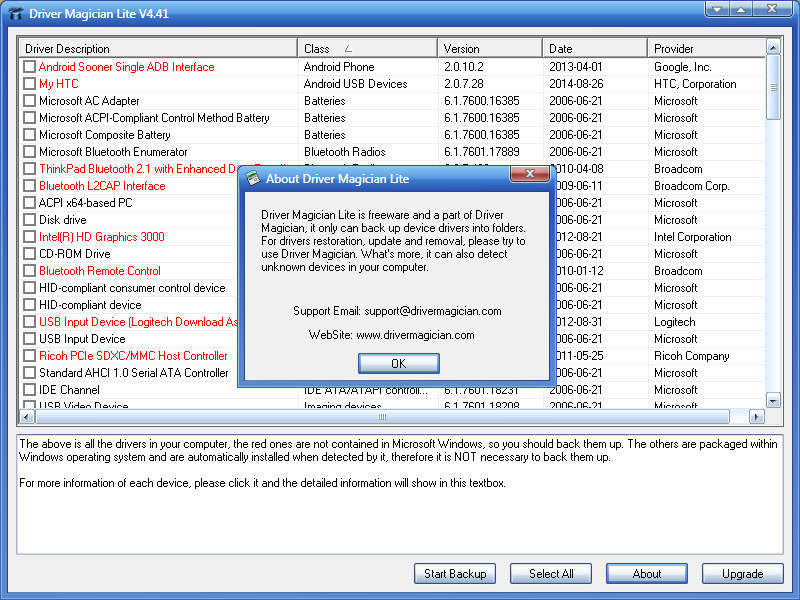 Driver Magician Lite will only back up, not restore, drivers. Driver Magician, available at the same site, restores drivers, but has a 15 day trial period.